Automate your Data Analysis Now! Is this familiar to you? In our eyes, this is the dashboard of the past. Now, technology is allowing us to automate more of our key business functions, and dashboards are no different. Want to know how you can put in less time and effort into your data analysis? This article will show you how dashboards are developing to let you automate each step of your data analysis. One of the most common questions that we get here at Target Dashboard is how to go about collecting all of your important data into one place, and then compare and report on that data. Usually, you would likely have to export data sets from your external sources into Excel, and then import those into your dashboard software. That or you’ll have to manually pull data out from your external sources, and push it into your dashboards. This wastes time, or worse, results in inaccurate data. There are now ways to automate your data collection that remove these issues. A single example is Target Dashboard’s own Data Grabber application, which allows you to pull data from most third-party sources ; Your data imports will always be up to date, so you’re always making the best, most-informed decisions. The implications of this kind of technology for managers are vast, as you can effectively set them up once, leave them, and never worry about out-of-date data. Once you’ve got your data into your dashboard application, you’ll obviously want to use that data to make decisions and take action. Again, this is something which many of our customers originally thought would be an issue, as charts would have to be manually updated whenever data is updated. 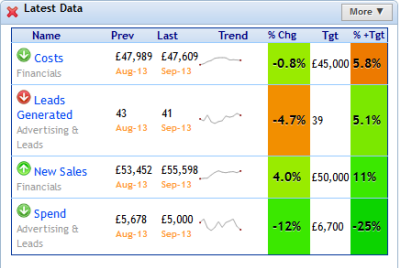 However, most dashboard applications now have charts which update along as soon as data is changed or updated. Not only does this mean one less thing to manage, but decisions and actions are always accurate with very little chance of error. After September’s spend is changed, the chart automatically updates! In Excel, creating a scorecard is quite tricky, even if you know how. Columns need to be assigned colours and formulae, and other visual indicators need to be created and assigned to different columns. However, the above scorecard was made automatically as a standard feature in Target Dashboard to give users important information at a glance. As the scorecard is effectively two or three charts in one, dashboard software which implements them can allow managers to make decisions and take action far more quickly than those that rely on the usual bar and line charts (that isn’t to say that these classics aren’t useful though!). Once you’ve collected your data and created charts and dashboards from it, you’ll have to monitor them to remain on top of everything. With so many other responsibilities, consistently keeping track of data in dashboards can be tricky. This is why there are so many options for getting data to the user, rather than the other way round. One of the best and most convenient ways we’ve found to keep track of data is the email alert, since many people work with their email open in front of them. This sends a digest of whatever information you specify at a time which is convenient and useful (e.g. every Monday morning). All the user has to do is open an email, and all the information they need for decision-making is right in front of them. Also, email alerts can let you know if any of your data measures has gone above or below a certain target value. These are especially useful if you have actions associated with your targets, as they allow you to act far sooner than usual. Data collection and analysis isn’t the easiest of tasks, but keeping track of everything and making sure it gets done is even trickier. Therefore, if you choose to use dashboard software to manage your data, you should make sure that it includes ways of automating each step of your data analysis, from gathering data to monitoring it. By doing so, you not only save time, but you can work in confidence that your data is always up to date, and is available when you need it. 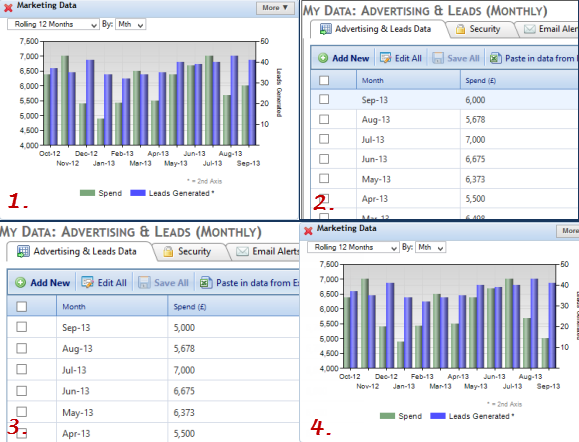 Here at Target Dashboard, we can help you create automated dashboards to manage your data. Why not contact us now to discuss more?